Someone just stole £300 from you! First Utility are an energy supplier dedicated to offering their customers the best price tarriff for electricity and gas. So if they supply your energy they ensure that you are on the markets cheapest policy. 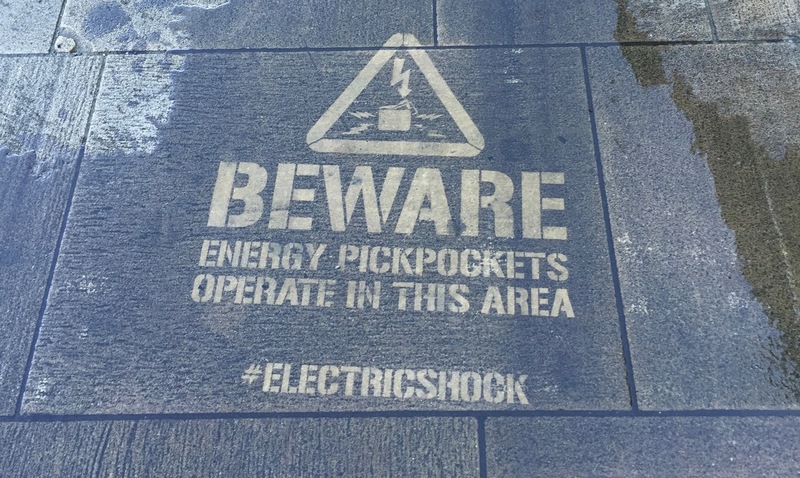 To highlight how much other energy suppliers are stealing from their customers, First Utility created a multi million pound ad campaign around the Yorkshire region which incorporated outdoor, experiential, online, print and TV. As a teaser for the campaign the client wanted to get their message onto the streets, targeting a specific segment of potential customer at a key moment in their lives. The campaign message was focused around stealing money from peoples pockets and what better time to do it than at a cashpoint when they are withdrawing cash. Billboard and poster sites, although effective in large numbers also has its limitations and First Utility wanted a more targeted location independent media. The solution? Clean Advertising! Clean Ads can be placed almost anywhere so SAS was briefed to place 300 adverts outside cashpoint machines in Large Yorkshire Towns and Cities. In addition to Clean Ads, we also painted a spectacular 3d pavement art picture that can be used on any surface by the First Utility team to deliver the brand message in a fun and interactive way.